Rescue workers airlifted residents from a half-submerged riverside district of the Swiss capital Thursday as large swathes of central and southern Europe remained underwater and the death toll from flooding rose to 42. Hardest hit was Romania with 31 victims — many of whom drowned as torrents of water rushed into their homes. Austria, Bulgaria, Germany and Switzerland reported a total of 11 dead, but numbers were expected to climb as more bodies of the missing are recovered. Across the Alps, military helicopters ferried in supplies to valleys cut off by flooding and evacuated stranded tourists and even cows isolated in mountain pastures by the rising waters. The river Aare broke through the windows of a children's clothes shop in Bern, leaving baby strollers and toys floating in muddy water in the deserted streets of the city's Matte district, while bicycle parts were plastered across the front of a house — 4.9 feet above the ground. "It really hits home when you see something like this," said fire service chief Franz Bachmann, who led the evacuation operation. "Lots of people have lost their whole existence." Residents looked on in tears as water receded slowly, offering the first glimpses of streets, squares and ground floors submerged in mud. All 1,100 residents of the low-lying area have been evacuated, police spokesman Franz Maerki said. Police kept guard to prevent people from returning, warning that deadly gushes of water could surge down from the mountains as blockages of debris and mud give way. "As soon as this wood is gone, the water here will rise rapidly again," Bachmann said. Many homes were in imminent danger of collapse, and electricity, phone service and gas were cut off, city authorities said. Flash flooding in Romania's hard-hit Harghita county spurred waves as high as 13 feet, authorities there said. Three people were missing in Harghita, including a 4-year-old girl, said Maria Magdalena Sipos, a local government official. Szillard Stranitsky, who drove through the area late Wednesday, said cars were unable to move because of the rain and mud on the roads. "I was scared of driving over a corpse, either human or animal, because I couldn't see a thing," he said. Meanwhile, officials in Austria turned their attention to the cleanup and reconstruction as the rains eased. "The danger is over," said Doris Ita, the head of Austria's flood emergency department. "But we are still watching the situation." Victims struggled to clear debris and shovel mud from their homes in the Austrian provinces of Tyrol and Vorarlberg, where many areas remained cut off by flooded roads. In Germany, the Danube flooded part of the southeastern town of Kelheim, including its Weltenburg Monastery, founded in the seventh century and described as the oldest in Bavaria. The ground floor of the Benedictine monastery, which draws 500,000 visitors a year, was submerged Thursday, said Father Benedikt, the monastery's prior. "The community is working feverishly to rescue what it can," Benedikt told The Associated Press. A 28-year-old man became the first victim of the floods in Germany late Wednesday, drowning near the southeastern town of Rosenheim when his rubber dinghy capsized. 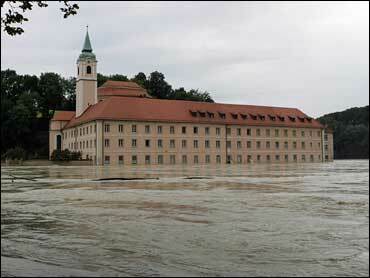 Elsewhere in Switzerland, much of the historic old city of Lucerne remained underwater. More than 350 policemen, firefighters and volunteers worked around the clock to remove debris and protect buildings as children played in flooded squares and streets. There was some good news: Swiss railways said main routes through the Alps connecting northern and southern Europe were open again. The national weather service MeteoSuisse predicted more rain Friday in Switzerland's northern Alps, but said it appeared unlikely to dramatically worsen the situation. In southern Poland, rivers broke their banks and at least seven bridges collapsed, but there were no reports of injuries caused by flooding. Swiss Reinsurance, the world's second-largest reinsurer, said economic losses from the flooding could reach $791 million dollars in Switzerland, Austria and Germany.